NME once described Mats Wawa as having “monster riffs”. It’s clear that NME’s idea of monster riffs and actual monster riffs are two different animals. Kyuss they most certainly aren’t and the chosen title might actually be a tongue in cheek joke, but that doesn’t escape the fact that this 2018 EP from Mats Wawa has some enjoyable moments. Actually, “enjoyable moments” is pretty much an understatement, since three quarters of ‘Scuzz’ is superb. First up, though, ‘True Crime’ presents the band at their least interesting. A solid sixties beat underlines chiming guitars that blend the chopping style of British Invasion pop with the gentle retro fuzziness of The Black Keys. Over the music, a high tenor vocal feels very much at odds with some Kinks-meets-psych pop vibes, but a snappy lead guitar break lifts everything considerably. It’s one of those numbers that seems to start well, but never really change or adapt from its origins and is probably best described as merely okay. It’s one of those numbers you wouldn’t necessarily mind if you heard it on the radio, but would be hard pressed to remember it ten minutes later. In an almost complete turnaround, lead single ‘Easy On The Eye’ isn’t just the best track on this EP but also an early contender for one of the best tracks of 2018. A shamelessly retro rhythm section with a dancing bass line sets a strong basis from which a classic pop tune springs most unexpectedly. Mats Wawa move from British pop to a very American soul sound, very much inspired by the gold foiled Harmony guitar recently acquired by band leader Mats Wang. At the heart of this very sparky tune, there’s something that sounds not so far from a neglected 1971 b-side from the Stax stable. Just a couple of listens to this is all that’s needed for the love of the style and the idea of an excellently written pop tune to shine through. A couple more listens and collection of “woo woos”, an energetic lead vocal and punchy pre-chorus flowing back into lovely “woo woos” will feel like something you’ve known and loved forever. It’s a real three minute gem. ‘Hard To Be Happy, Easy To Be Nice’ delves just as deeply into soul for its core influence, with a clean and pumped bassline, pounded snare drum and stabbed keys. In addition, though, it also borrows from an alt-pop sphere, and a few of the louder guitars as well an accented vocal makes everything sound slightly reminiscent of Scandinavian pop heroes Team Me, which isn’t a bad thing. Adding a slightly fuzzy wah-wahed solo, there’s a lot going on here and much to enjoy, but it’s not all busy for the sake of it… Looking beyond the very sixties sound, a couple of the lead guitars elsewhere carry the gentle and almost bendy sound of George Harrison’s work, especially that from his eponymous LP from 1979. All things considered, this is a great tune, but those who like an upfront bass and/or stabbing keys are the listeners destined to gain the biggest listening thrills. Interestingly, the EP’s closer ‘George Harrison Beatle’ owes far less to the quiet moptop than bits of the previous track, but what emerges is brilliantly swooning twee pop that comes across like an unholy marriage of ‘Soft Bulletin’ era Flaming Lips with the shameless easy listening traits of ‘Home Counties’ by Saint Etienne thrown in for good measure. The gentle approach to song writing is important (and it’s arguably one of the tracks that’s most sympathetic to the vocal style), but its the way the band arranges their music that’s the key to greatness. Throughout the instrumental parts of this number, an unshakable rhythm guitar works beautifully, but in the end, its the combination of warm bass and flute combined with lead guitar flourishes that carries everything. If you’re looking for something that very much resurrects the sounds of a bygone time and have a passing fancy for the fuzzier moments from 70s era Isley Brothers this will appeal, though perhaps not as much as ‘Easy On The Eye’. Okay, so the vocals can be a little testing in places – unless, of course, you’re one of those people who doesn’t mind something that sounds a bit like Mercury Rev man Jonathan Donoghue – but most of these tunes have a lovably retro pop, AM radio soul that it’s hard not to love. 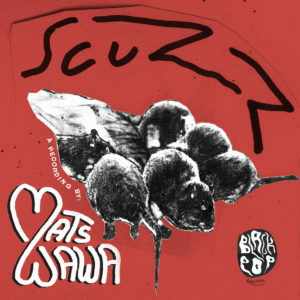 With ‘Scuzz’, Mats Wawa offer a largely brilliant spring and summer soundtrack, whatever the time and place. A welcome surprise, indeed. This entry was posted in Album & EP Reviews and tagged indie, mats wawa, pop, rock, soul by Real Gone. Bookmark the permalink.